100% pure emu oil, fully refined to the highest quality and purity. Emu oil has been shown to reduce the depth and length of fine lines & wrinkles in many studies as well as being moisturising and a natural skin softener. It has been proven to be the fastest and most penetrating oil into the skin, as well as a carrier for any other therapeutic ingredients or skin care. 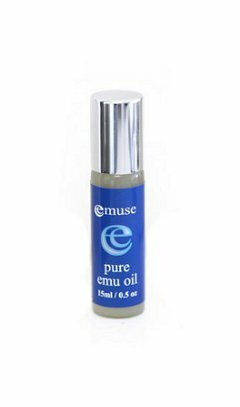 Emu oil is deeply moisturising and will relieve sunburn, dry skin and skin rash, it can also help to heal scars, burns and stretch marks. That's why the Australian Aborigines have used pure Emu Oil for thousands of years, for it's unique abilities to heal the body in many ways. Emu Oil is similar to our skins natural oils, so it will replace lost moisture to fight wrinkles and prevent pre-mature ageing. Emu Oil is a very effective anti-inflammatory, making it ideal to aid in the treatment of inflammation and pain like Arthritis and muscle tension. * Hyper-Oxygenated - Emu Oil is ideal for Skin Care and Hair Care because it increases blood circulation where ever it's applied. * Anti Bacterial - Emu Oil is anti-bacterial, making it effective to heal infections. 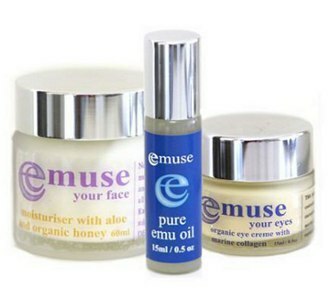 * Emu Oil is 100% safe and natural, a natural emollient, and has no bad side effects. 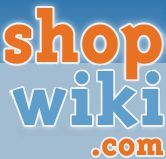 To use internally take 1 teaspoon (5ml) 2 - 3 times a day. To use Externally rub a small amount into the effected area each day.